#522* – Three Cheers for Nigel Farage?? Three Cheers for Nigel Farage?? ONE CAN DUPE THE UNINFORMED! I STAND IN AWE of Nigel Farage. He is the oratorical master of the European Parliament, which, of course, doesn’t count for much since about as much attention is paid to the European Parliament as was to the Reichstag in Nazi Germany. This is despite the fact that the majority of laws passed by the Parliament of the United Kingdom are not actually initiated by British MPs, but rather rubber-stamped from Brussels on high. If you’re asking yourself “Who is this fellow?”, then I should tell you that Farage is the somewhat-hokey leader of the United Kingdom Independence Party, the party which should get the votes of all visitors of this site. These days, one should be a Tory every day of the year except Election Day. The next general election is especially important as it must be proved to the bigwigs in the Conservative Party that Europe matters. Labour will likely win the next election anyhow (it’s even possible for the Tories to have 10% more of the popular vote but still come out with fewer seats than Labour), and the more seats that the Tories lose because…. 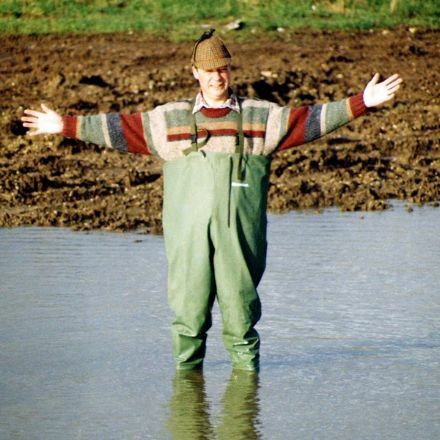 It is a lengthy article with many links and also carries the now well publicised disingenuous photograph of Nigel Farage, standing in a puddle on a building site, which Mark Croucher claims to have taken several years ago and seeded, without any attempt to protect or even display his copyright. He has thus provided it as effectively a public domain picture, hence it has been used – as it was originally intended – as a publicity photo when Croucher was employed by the EU in some publicity capacity. http:CaterpillarsAndButterflies.Blogspot.com of more than passing interest! Farage’s self serving conceit and propensity for talking to camera in empty rooms in a pretence of robust debate is little more than childish ego driven bragadoccio. Farage has done a great deal to damage The EUroSceptic movement by undermining its credibility with lies in his own interest – sadly The EU gives him £Millions with which to pay Praise Singers and sychophants. Sadly one can always find dishonest little men to lie for one when the rewards are liberal – he has done much to promote The BNP whilst cozying up through Mark Croucher, his personal spin liar, to the extremist and vile Searchlight organisation. Farage has for several years now chaired the pro EU Ind.De.Group in the EU pretend Parliament with its total lack, NOT just a deficit, of Democracy. I trust you will have no objection that I have linked with this article from my site. UKIP? Neo-fascist? You’ve got to be kidding me! UKIP are more moderate than Labour and the Lib-Dems who want to remake the whole of Britain in their image. Sadly, thanks to the leftward drift of the Conservative Party’s leaders, UKIP will soon be more moderate then them too. The fact that you feel the need to call them “neofascist” shows how desperate you are! Why not make an argument against their specific policies or positions? Sadly she seems to have noted the froth on top of the class but not the foam of rat poisin below! Farage gained control of EUkip through the lies and corruption of a small claque and with the use of a great deal of Party cash. This led to a collapse of membership from around 30,000 to somewhere short of 10,000 where many of the risidual members were ‘the armchair’ uninformed vote and his corruption has led to an exodus of the activists and the making of many legitimate and honest enemies. In the latter half of last year realising the party was heading for the rocks Farage opted to construct a ‘Reichstag Fire’ moment – so VERY redollent of the politics of The EU with a beneficial crisis!! Farage and a small group of his fantasists invented the fantasy of a BNP infiltration based on the most febrile of plots – to this day he has not named a single serious BNP infiltrator! He LIED. This has given rise to the possibility through a ‘Crystal Nacht’ orf removing elected Officers who demanded probity and honest accounts based on transparency. Farage has taken a lurch back into a dark ages of politics centralising power as an authoritarian and neo fascist style (or if you prefer BNP style) form of management as a personalised feifdom. Farage is very plausible, an excellent performer at times as are often moral dyslexics as they believe their own fantasies. EUkip were heading for 0-3 MEPs until they became the dustbin of the protest votes over the abuse of expenses at Westminster and the dominance of the hugely unpopular Brown Government faced by the wet and venal Tories as an opposition. The EU elections on June 4th. are all about Westminster protest and have absolutely ignored the EU and its vile corruption from which Farage boasts to have ‘lifted’ over £2M in unaccounted claims – when questioned by The Sun newspaper he confessed he hadn’t a clue what happened to this not inconsequential tranche of tax payers’ money. All is not what it seems in Britain under the dictatorship of the reveilled dictatorship in Brusells!